Getting to the Core of the Issue | Mason-Dallas Inc.
WHY do we have the reputation of being the #1 Vibration Control Experts in the region? 120 years of combined experience in the field of vibration & noise control. Unparalleled service, knowledge and “our word is our bond” attitude. Since 1978 WE SUPPLIED OUR PRODUCTS ON MOST OF THE PREMIER PROJECTS IN REGION. A FEW ARE SHOWN TO THE RIGHT. Beginning in the 1980’s, the electrical engineering community caused a paradigm shift in the HVAC Industry. Electrical switchgear, which had been installed typically outside, in parking garages or in basement equipment rooms was now being installed in the office buildings, close to occupied spaces. 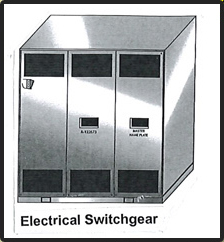 Switchgear is a combination of diconnects, switches, fuses or circult breakers that open and close the electrical circuits under normal or abnormal conditions. Typical units consist of a high voltage section(s), transformer section and a low voltage section(s) that bolt together forming a larger sheet metal box. By moving the switchgear into the building and closer to the occupants the cost of the equipment and the installation was less expensive. This change led to smaller diameter primary wiring and smaller kVA requirements. But there was an unforeseen side effect: the transformers were noisy. In addition, the hum and vibration generated by the iron core traveled into occupied areas, making some areas more noisy and difficult to work in. We first became involved with these noise issues in 1983 when we received a call from BL&P had recently located the switchgear in an office building. As a result, the transformer hum was radiating in a restaurant located in that same building. We requested and received submittals of the switchgear. They were 750, 1500 and 2000kVA in size. We reviewed the information and then met at the jobsite with BL&P’s Mr. Jack Brady, P.E., the switchgear manufacturer’s sales manager and the electrical contractor, W.B Moore. Since we could not see the source of the challenge (the transformer), from the outside of the unit, the contractor needed to shut down the unit. They removed the transformer section panel and most importantly, discharged the transformer before we could get inside to take measurements. It is important to note that even though the transformer had been shut down it still held a charge that could kill unless it was properly discharged. What we noticed inside the unit is pretty much what we have seen in all our inspections of switchgear transformers throughout the years. 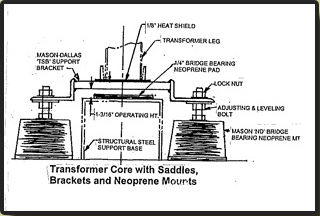 The transformer sat on rubber pads, which rested on structural steel members that were an integral part of the unit’s perimeter steel base. The enclosure panels were then directly connected to the perimeter steel base. 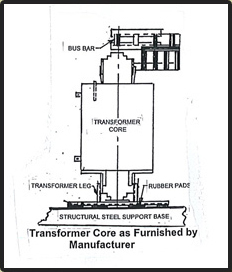 Even though the transformer was isolated using rubber pads, those pads were resting on the unit’s steel base. Therefore, the pads were doing little to prevent the vibratory energy from traveling through the steel support to the structure. In addition, since the structural steel supporting the transformer was also attached to the steel perimeter, the energy in the support steel excited the perimeter panels and added even more energy to vibration and noise conditions. 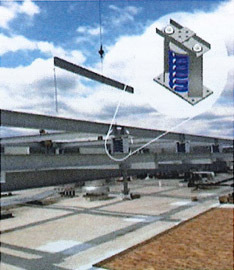 Our challenge was to design a vibration isolation system that would fit into the allowable space and would minimize the amount of energy traveling to the structure from the steel support frame and panels. To solve the issue we designed a saddle support system using a steel plate, brackets and specially compounded neoprene mounts. After approval of our design by both the engineer and the manufacturer, we then effectively lifted the transformer off the structural steel support with the saddles and positioned the neoprene mounts on the concrete floor. By doing so, we now had the transformer core entirely off the structural steel base, using the resiliency of the neoprene mounts and the mass and dampening of the concrete floor to resolve the issue. The design worked perfectly and the vibration and noise was eliminated. Thanks to Mr. Brady’s call for help, we have continued to use the saddle and bracket approach on other projects with the same challenges. Over the years we have solved similar problems in Dallas, Irving, Houston, Southlake and New Orleans, for our clients. If you or someone you know is facing any vibration or noise issues, particularly one caused by electrical equipment, please give us a call at 817-267-8651. Make Mason-Dallas YOUR FIRST CALL! On college campuses all over the country, the end of the school year is marked not only by graduations, celebrations, and the start of the summer vacation, but also the mad dash to get major projects and equipment upgrades completed before the start of the following school year. At the end of May, we received a frantic call from a contractor in the midst of a cooling tower replacement at Carnegie Mellon University in Pittsburgh. They needed the cooling tower support steel frame designs, including certified wind calculations for the code prescribed 110 mph wind, and 4″ deflection restrained isolators; Right Now! By the time we got the call there was tremendous pressure on the customer to meet the schedule, and as is typical, they were running behind and were asking for our representative, Walsh Value, to help get them out of this jam. The cooling towers were scheduled to arrive on site in 6 weeks and with our designs and material the towers could not be set. That gave us 4 weeks, including transit time to Pittsburgh. Just to help matters, the mounts had to be hot dipped galvanized, which normally takes two weeks. Our team of engineers and production people took the challenge. Complete steel designs, wind load calculations and fabrication drawings were completed within a week. Our production team got the mounts fabricated and ready for the galvanizer within a week and a half. And the galvanizer came through too. Working with several of these time sensitive projects most of the time, we are usually too busy to stop and take photos. Fortunately, the project manager was so impressed that they were kind enough to share a photo of the last piece of steel being installed only 5 weeks after we received the initial phone call and while indistinct you can see the size of the isolators too.